By some reckoning hydroelectric power is China's second-biggest energy source after coal. In 2008, hydropwer accounted for 16.4 percent of China's total energy output, compared to 80 percent for coal, oil and thermopower and 2 percent for nuclear energy. While China is racing ahead to install more wind- and solar-power capacity, the energy generated by these works is considered too costly and insufficient to satisfy the country's voracious power needs. The drought in 2011 reduced the output of hydroelectric power, contributing to a government decision to raise the cost of electricity for industrial use in 15 areas. Hydroelectric power is viewed as a relatively clean alternative to the heavily polluting coal-fired plants that are China's main source of energy. But some critics have questioned the potential environmental and social impact of so many huge projects. China boasts nearly half of the world’s 50,000 large dams---three times more than the United States “and construction continues.Twenty major dams punctuate the Yellow River and another 18 are scheduled to be built by 2030. Share of the worlds dams: 1) China (45 percent); 2) the United States (14 percent); 3) India (9 percent); 4) Japan (6 percent); Other countries (26 percent). Energy shortages are encouraging more dam building. Authorities think nothing of relocating 50,000 people to make a dam that will provide electricity for a new industrial area. Between 1949 and 2008 about 12.5 million Chinese citizens have been moved to make way for 86,000 dams. Dams have been built to control flooding, improve transportation, generate electricity, provide water for irrigation, collect water for human consumption, and make rivers navigable. Dams however have many critics. Many object to them for environmental reasons, say they waste money, cause the destruction of productive farmland, force the relocation thousands of people and in the end don’t do what they supposed to do or only do it for a short period of time. The Three Gates Gorge Dam, for example, was destroyed only four years after it went into operation in 1960 because 62 percent if the reservoir was filled with mud. A large dam n Ningxia Hui Autonomous Region produces only about a third of electricity it was designed to produce due to lack or water caused by droughts and erosion. Dams gives Chinese planners additional flexibility in managing storage and release of water to adapt to floods, extremes in rainfall and drought. Extreme water and weather therefore means more dams, not fewer. In 2011 after a drought was followed by severe floods, Dr John Yin, a hydrologist at the University of San Diego, told Asia Times Online: "I believe that these recent extreme events will provide ammunition to those who want to build more large dams for increasing storage capacity to handle flooding and/or water shortage problems." Sanmenxia Dam was completed in 1960, displacing 400,000 people. It was supposed stop chronic flooding on the Yellow River. Instead it slowed the rivers current, causing silting on a massive scale and increasing the likelihood of flooding. One engineer tod National Geographic the only way to fix it is to blow it up. Others have suggested build another dam to correct the problems made by Sanmenxia. The 400,000 people displaced by Sanmenxia were resettled from fertile land to a desert region 500 miles away. By some estimates a thirds of them died in the famine that followed the Great Leap Forward. Many of the survivors made their way back to land near the land they were displaced from. When heavy rains fell the Sanmenxia reservoir back up, pushing polluted water over its banks. Three flood in five years destroyed cotton crops and poisoned villager’s water supply. 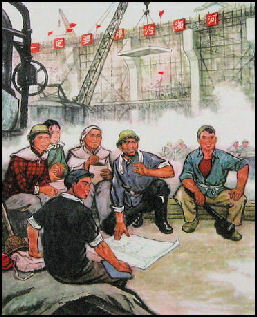 The San Men Xia Dam was a gigantic failure for which Mao and his planners were directly responsible. Built on the Yellow River with Soviet assistance in the 1950s and desperately and expensively repaired by China alone in the 1960s, it consumed a disproportionate share of the national budget and served as a drag on economic growth. Xie Chaoping was of detained for 30 days in 2010 for publishing a self-funded book, Great Migration , that disclosed the predicament of migrants and the corruption of officials during relocations to make way for the Sanmen Gorge dam in the 1950s. Xie's book outlines how peasants were tricked in the 1950s into leaving their fertile land on the promise of a better life in Ningxia . Those who did not starve to death within months were banned from returning to their ancestral homeland until the 1980s. The migrants were on the move for decades, some moving eight times. In 1985 the central government ordered the local government to allocate 20,000 hectares of land to 150,000 migrants and pay them 120 million yuan in compensation. But only about half moved back, Xie's book says. They took up about 70 per cent of the land allocated to them. Xie says that according to Dali county government statistics, their average income in 2007 was about 1,150 yuan - half that of those who were not forced to move. After the disaster of the Banqiao dam failure, the Chinese government became very focused on surveillance, repair, and consolidation of reservoir dams. China has 87,000 reservoirs across the country; most of which were built in the 1950s-1970s using low construction standards. Most of these reservoirs are in serious disrepair, posing challenges to the prevention and control of flood-triggered geological disasters in areas with a population of 130 million or more. China's medium and small rivers are considered to be the Achilles' heel in the country's river control systems. According to statistics from the Ministry of Water Resources, China has invested CN¥ 64.9 billion (US$9.72 billion) since the 1998 Yangtze River floods in repairing and consolidating the country's 9197 degraded reservoirs, of which 2397 are large or medium sized, and 6800 are key small reservoirs. All of the above projects should be finished before the end of 2010. However, there are 5400 small (1) reservoirs and a great many even smaller (2) reservoirs in need of repair. The capacity of a small (1) reservoir is defined to be between 1 million m³ and 10 million m³. The capacity of a small (2) reservoir is defined to be between 100,000 m³ and 1 million m³. Projects to repair and consolidate 5400 small (1) reservoirs will be completed before the end of 2012. Projects for the remaining smaller (2) reservoirs will be completed within 3–5 years. Twenty major dams punctuate the Yellow River and another 18 are scheduled to be built by 2030. The massive $4.17 billion Yellow River Dam built near Xiaolangdi in central China is the nation's second largest dam project after the Three Gorges Dam. The main purpose of the earthen dam is to halt the rising river by flushing out the silt. This will be accomplished with 16 reinforced tunnels that cut through an adjacent mountain which allow engineers to regulate the flow of water. During the wet season water can be stored in the reservoir to prevent flooding, and during the dry season it can be released to flush out sediment as well as provide water for irrigation. The reservoir behind the dam will be able store water until the year 2020. At the time no more water can released to flush out the sediment down river and the river and levees will once again start rising. "Our children and grandchildren will need to think of another solution to the silt problem," one engineer told Newsweek. In June 2009, the Chinese media reported that several dams on tributaries of the Yellow River were near collapse shortly after being built. According to the China Sailu at least five dams in Huan County in Gansu Province are “in very fragile condition.” Shoddy construction and embezzlement were blamed for the problem. The Yellow River dam will protect 120 million people from the river's notorious flooding; better allocate water so deprived farmlands get their share of irrigation water; and ensure the river doesn't dry up like it has in the past. The dam will make 30 percent more water available for irrigation, which will reduce dependency on wells and ground water, and produce 1,800 kilowatts of electricity (valued at $170 million a year). This is only a tenth of the power produced by much swifter moving Yangtze River at the Three Gorges Dam. Unlike the Three Gorges project, the Yellow River dam has received a favorable reception from bankers and environmentalists. Its estimated cost is only a forth of the Three Gorges Dam. The U.S Export-Import Bank and the World Bank have pledged over $1 billion in loans. What is more, China is actively seeking to export its Three Gorges expertise abroad, signing up agreements to build hydropower works in countries from Cambodia to Pakistan and Nigeria. According to the United Nations Food and Agriculture Organization, China’s dams had the capacity to store 562.4 cubic kilometers of water in 2005, or 20 percent of the country’s total renewable water resources. Since then, China has built scores of new dams, including the world’s largest: the Three Gorges Dam on the Yangtze River. China’s powerful hydro---power lobby argued that dams also offered a clean way to reduce the nation’s dependency on power plants fired by carbon-belching coal, which generate about three-quarters of China’s electricity. In 2000, with demand for power surging along China’s east coast, Beijing launched a policy known as “sending electricity from west to east,” pushing for new dams on rivers in Tibet, Sichuan and Yunnan, In 2002, however, the industry hit an obstacle---a new law that required an environmental impact assessment for each project before work could start. Under pressure from emboldened environmentalists, Premier Wen Jiabao ordered Huaneng, a state electricity company then run by Li Peng’s son, to suspend a huge dam planned for the Nu River in Yunnan. The social costs have been even higher, a fact reflected in Chinese Prime Minister Wen Jiabao’s stunning admission in 2007 that, since 1949, China has relocated a total of 22.9 million Chinese to make way for water projects---a figure larger than the populations of Australia, Romania, or Chile. Since then, another 350,000 residents---mostly poor villagers---have been uprooted. So, by official count alone, 1,035 citizens on average have been forcibly evicted for water projects every day for more than six decades. With China now increasingly damming transnational rivers such as the Mekong, Salween, Brahmaputra, Irtysh, Illy, and Amur, the new projects threaten to “export” the serious degradation haunting China’s internal rivers to those rivers. The time has come to exert concerted external pressure on China to rein in its dam frenzy and embrace international environmental standards. Large numbers rural people have lost their homes as a result of hydroelectric dam projects. Some have been evicted from their land and received little or no compensation. Without a means of making a living, many of the displaced people migrate to the cities. Between 1949 and 1999, 17.5 million people---twice the population of London - were relocated for dams. Since then, the pace has accelerated thanks to mega-projects like the Three Gorges dam, which has forced the relocation of 1.5 million people, and the South-North diversion. There have been a number of protests against dams. In November 2004, 90,000 farmers in Sichuan Province, frustrated by a lack of response to their complaints over the seizure of their land for a dam project in Hanyuan County, barred workers from entering the dam site for days. It took 10,000 paramilitary troops to put down the protest. An environmental group called the Green Watershed was formed to help farmers affected by the dams proposed for the Three Parallel Rivers area of Sichuan and Yunnan. The group has organized residents in the area of the dams to petition authorities and has forged links with international environmental groups. Farmers in the Three Parallel Rivers area were enraged by the secretive and cagey way the government is pressuring to have the project built. They are aware of what happened at the Three Gorges Dam and are worried the they will suffer the same fate as farmers there. Some feel a small is better strategy would work more effectively. A number of countries have had success with microhydroelectric plants. The systems’set up with support of local people---divert waters from streams and rivers to run turbines with complex dams and catchment areas. Plants produce up to 200 kilowatts, enough to provide electricity for 200 to 500 homes. A report by China's Economic Observer suggested the hydropower industry has overcome the political and environmental obstacles of the past five years and will now accelerate dam building. In January 2011, the National Energy Agency said China plans to build an additional 140 gigawatts of hydropower capacity in the next five years as it tries to achieve the goal of producing 15 percent of its energy from non-fossil fuel sources by 2020. Both the profit motive and a diplomatic effort to showcase its engineering prowess drive China’s overseas dam-building efforts. China’s declared policy of “noninterference in domestic affairs” actually serves as a virtual license to pursue dam projects that flood lands and forcibly uproot people---including, as with Myitsone, ethnic minorities---in other countries. But it is doing the same at home by shifting its focus from dam-saturated internal rivers to the international rivers that originate in the Tibetan plateau, Xinjiang, Inner Mongolia, and Manchuria. China contends that its role as the global leader in exporting dams has created a “win-win” situation for host countries and its own companies. But evidence from a number of project sites shows that the dams are exacting a serious environmental toll on those hosts. As the world’s most dammed country, China is already the largest producer of hydropower globally, with a generating capacity of more than 170 gigawatts. Yet ambitious plans to boost its hydro-generating capacity significantly by damming international rivers have embroiled the country in water disputes with most neighbors, even North Korea. More broadly, China’s dam-building passion has spawned two key developments. First, Chinese companies now dominate the global hydropower-equipment export market. Sinohydro alone, having eclipsed Western equipment suppliers like ABB, Alstom, General Electric, and Siemens, claims to control half the market. Second, the state-run hydropower industry’s growing clout within China has led the government to campaign aggressively for overseas dam projects by offering low-interest loans to other governments. At home, it recently unveiled a mammoth new $635 billion investment program in water infrastructure over the next decade, more than a third of which will be channeled into building dams, reservoirs, and other supply structures. The now-stalled $3.6 billion Myitsone Dam, located at the headwaters of Burma’s largest river, the Irrawaddy, was designed to pump electricity exclusively into China’s power grid, despite the fact that Burma suffers daily power outages. The State-Owned Assets Supervision and Administration Commission of China’s State Council hailed Myitsone as a model overseas project serving Chinese interests. The Burmese decision thus shocked China’s government, which had begun treating Burma as a reliable client state (one where it still has significant interests, including the ongoing construction of a multibillion-dollar oil and natural-gas pipeline). Text Sources: New York Times, Washington Post, Los Angeles Times, Times of London, National Geographic, The New Yorker, Time, Newsweek, Reuters, AP, Lonely Planet Guides, Compton’s Encyclopedia and various books and other publications.